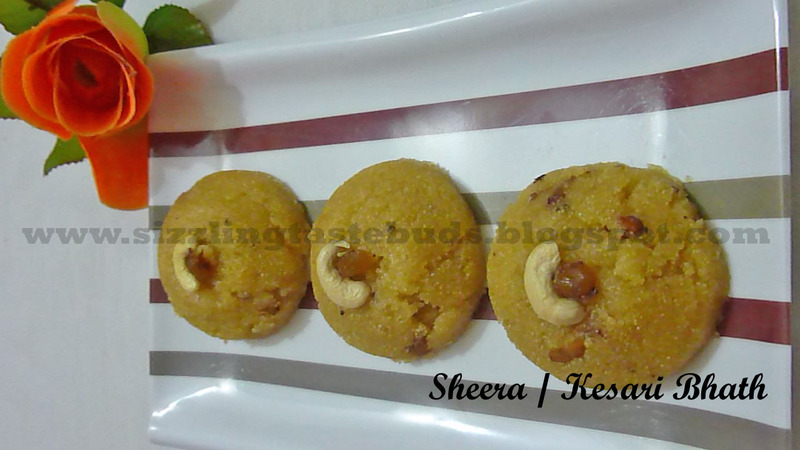 Sheera is also known as Kesari Bhath. Whenever we go the restaurants for breakfast during our vacation, we don't miss this particular dish. During some functions in Goa, my grandma used to prepare some similar dish made of rice instead of Sooji/ Semolina which the Goans call it as Kesari Bhath. 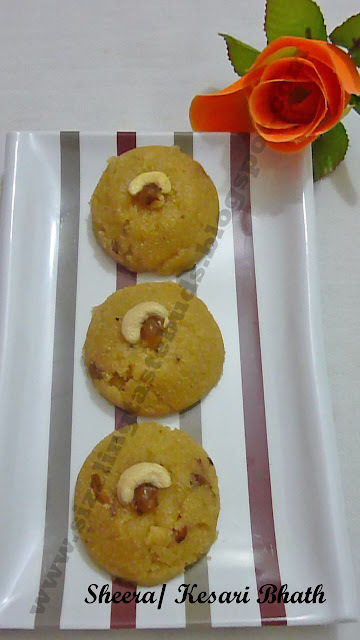 Here in Bangalore, Sheera ( Sooji ka Halwa) is called as Kesari Bhath. So when you wish to have this in Bangalore, you have to order it as "Kesari Bhath". Kesari means Saffron. This is one dessert which we used to get in our relatives home for evenings when we give them a surprise visit in our native. So its a jat pat recipe with few ingredients. This was my first try for Sheera in my kitchen. I absoultely love this dish. This is also prepared by priests during pooja's especially when we conduct Satya Narayan Pooja. They add little milk and banana pieces and lots of ghee too. And thats why I never gave it a try. Last week, I thought of preparing this because my husband likes this with poori's and it was in his want list from years. Just for the fear of the ghee quantity which goes into this, I never thought of preparing this. And beleive me, I just added 3-4 tsp of ghee and got the same texture and flavour. So now I am confident enough to try this in my kitchen. So here's the recipe of Sheera/ Kesari Bhath/ Sooji Halwa or whatever you name it. Sugar - 3/4 cup or according to your taste level. 1.Dry roast the rava/semolina for 3-4 mins in low-medium flame and keep aside. 2. Fry raisins and cashewnuts in ghee and keep aside. 3. Pour 3 cups of water in a heavy bottomed vessel and add sugar to it. 4. When water starts boiling, reduce the flame and start adding rava/ semolia little by little while stirring continously to avoid lumps. Also add a pinch of Saffron color at this point. 5. Keep stirring till the mixture thickens up and you get halwa constistency. Add ghee , elachi powder and nuts to this and mix well. Close the lid switch off the gas and leave it untouched for 3-4 mins. 6. Serve hot or cold. I prefer to eat it when its cold. You can also spread this on greased plate and cut in any desired shape and serve it. Yummy , tasty and aromatic Sooji ka halwa/ Sheera / kesari Bhath is ready to serve. thiss is my daughters fave dish..thanks for dropping by my blog..
Halwa looks delicious and yummy. 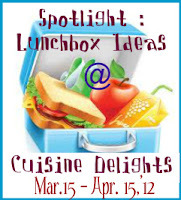 Thanks for linking my event.